Researchers at The University of Texas MD Anderson Cancer Center have identified a link between an enzyme tied to cancer formation and therapy resistance in patients with epidermal growth factor receptor (EGFR)-mutant non-small cell lung cancer (NSCLC). They believe two existing therapies may hold promise for clinical studies for this deadly and common lung cancer for which relapse often occurs within one year following treatment. The study revealed a unique “addiction” between the enzyme protein kinase C delta (PKCδ) found in NSCLC tumors and standard-of-care treatment called EGFR tyrosine kinase inhibitors (TKIs). Based on mouse and human tissue samples, this link allows PKCδ to lessen TKIs’ ability to forestall cancer. Findings were published in the Dec. 10 online issue of Cancer Cell. Approximately 160,000 people in the U.S. are diagnosed with NSCLC each year, and roughly 15,000 have metastatic disease with EGFR mutations. EGFR are proteins belonging to a family called receptor tyrosine kinases (RTKs) frequently mutated in NSCLC which cause cellular changes, including enhanced cell growth, tumor formation and metastasis. TKIs interrupt EGFR cell signaling and suppress tumor development. Yet treated tumors eventually develop resistance due to multiple mechanisms known collectively as tumor heterogeneity resistance, which includes additional mutations of EGFR and/or overexpression of other RTKs. New generations of TKIs targeting specific resistant mechanisms have been developed, which help patients live for several more months, but relapse still occurs and patients eventually are left with no treatment options. To overcome tumor heterogeneity resistance, it is critical to identify a common mediator, which, when blocked, may provide effective treatment, Hung added. The team observed high levels of PKCδ activation in tumor-bearing mice and patient tissue samples, which revealed PKCδ is a requirement for TKI resistance and is associated with worse progression-free survival following TKI treatment. The team discovered a combination of two therapies studied in mice, gefitinib and sotrastaurin, appear to be effective as a potential therapy strategy for EGFR-mutant NSCLC TKI resistance. Gefitinib is an FDA-approved TKI for EGFR-mutant NSCLC, while sotrastaurin is approved for use in clinical trials in cancer and other diseases. 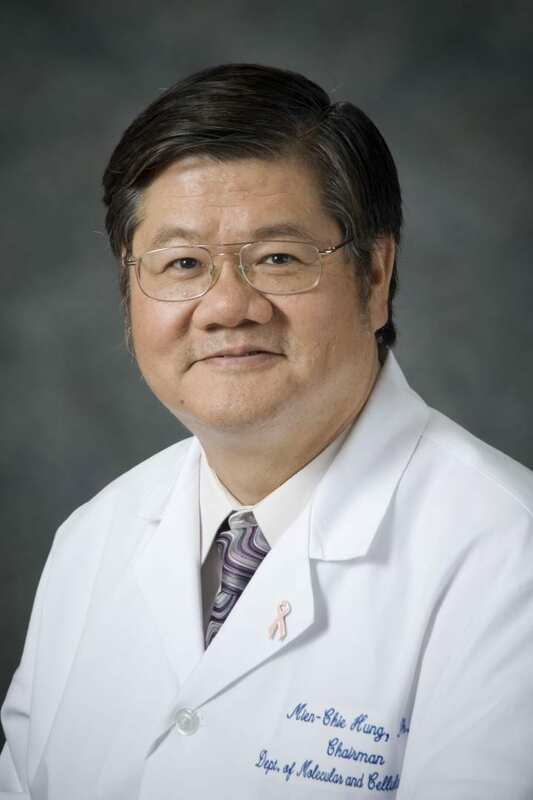 MD Anderson team members included Pei-Chih Lee, Ph.D.; Yueh-Fu Feng, M.D. ; Hirohito Yamaguchi, D.V.M., Ph.D.; Wei-Jan Wang, Ph.D.; Xuan Hong, M.D., Ph.D.; Baozhen Ke, B.S. ; Weiha Xia, M.D. ; Yongkun Wi, M.D., Ph.D.; Zhengyu Zha, Ph.D.; Yan Wang, Ph.D.; Lei Nie, Ph.D.; Junwei Hou, Ph.D.; Chun-Te Chen, Ph.D.; Longfei Huo, Ph.D.; Wen-Hao Yang, Ph.D.; Rong Deng, Ph.D.; Katusuya Nakai, M.D. ; Yi-Hsin Hsu, Ph.D.; Shi-Shin Chang, Ph.D.; Tai-Jan Chiu, M.D. ; Jun Tang, M.D. and Jennifer Hsu, Ph.D., all of the Department of Molecular and Cellular Oncology; Ran Zhang, Ph.D., Li Wang, Ph.D., and Bingliang Fang, M.D., Ph.D., of Thoracic and Cardiovascular Surgery. Other participating institutions include: Chang Gung Memorial Hospital, Saint Paul’s Hospital, and Chang Gung University College of Medicine, Taoyuan, Taiwan; Harbin Medical University Cancer Hospital, Heilongjiang, China; China Medical University and National Chung-Hsing University, Taichung, Taiwan; Sun Yat-sen University, Guangzhou, China; Chang Gung University College of Medicine, Kaohsiung, Taiwan; Langone Medical Center, New York; and Dana-Farber Cancer Institute, Boston. The study was funded by the National Institutes of Health (CA109311, CA099031 and P30 CA16672); The MD Anderson Cancer Center-China Medical University and Hospital Sister Institution Fund; the Ministry of Science and Technology; International Research-intensive Centers of Excellence in Taiwan (I-RiCE, MOST 105-2911-I-002-302); the Ministry of Health and Welfare; China Medical University Hospital Cancer Research Center of Excellence (MOHW106-TDU-B-212-144003); the Center for Biological Pathways; and Chang Gung Memorial Hospital Grant (CMRPG3D1911).